Webb Michael Pierce (August 8, 1921 – February 24, 1991) was one of the most popular American honky tonk vocalists of the 1950s, charting more number one hits than any other country artist during the decade. His biggest hit was “In the Jailhouse Now,” which charted for 37 weeks in 1955, 21 of them at number one. Pierce also charted number one for several weeks’ each with his recordings of “Slowly” (1954), “Love, Love, Love” (1955), “I Don’t Care” (1955), “There Stands the Glass” (1953), “More and More” (1954), “I Ain’t Never” (1959), and his first number one “Wondering,” which stayed at the top spot for four of its 27 weeks’ charting in 1952. For many, Pierce, with his flamboyant Nudie suits and twin silver dollar-lined convertibles, became the most recognizable face of country music of the era and its excesses. Pierce was a one-time member of the Grand Ole Opry and was posthumously inducted into the Country Music Hall of Fame. 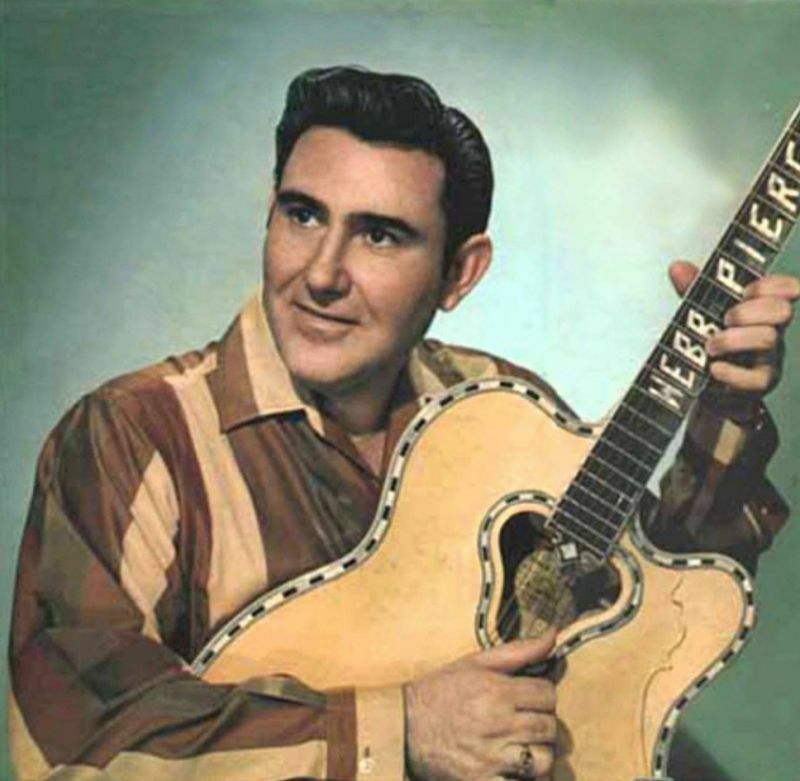 A tribute in his honor (produced by singer/songwriter Gail Davies) was released in 2001 entitled Caught In The Webb – A Tribute To Country Legend Webb Pierce. Pierce has a star on the Hollywood Walk of Fame at 1600 Vine Street. He was inducted into the Country Music Hall of Fame in October 2001 and into the Louisiana Music Hall of Fame in 2008. 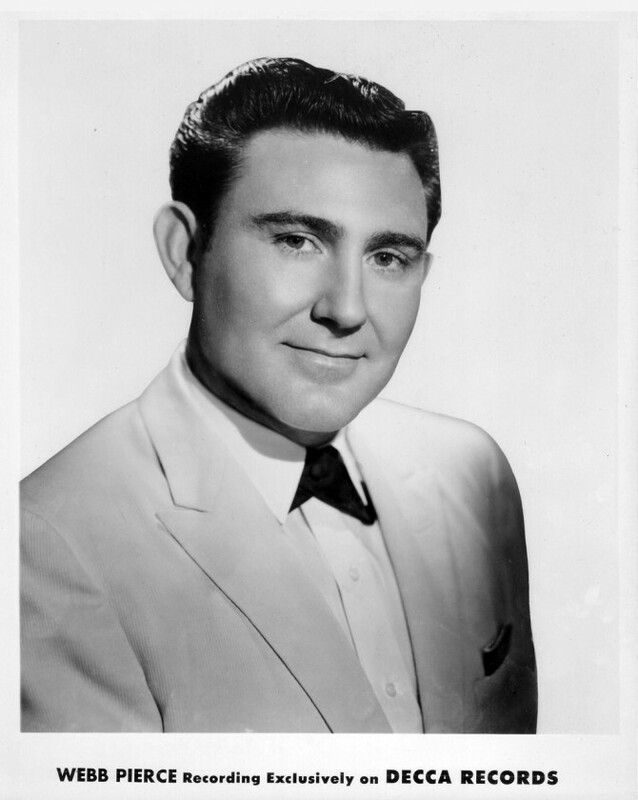 Caught In The Webb – a Tribute to the Legendary Webb Pierce was released on Audium Records in 2001. Produced and arranged by singer-songwriter Gail Davies, this album features Willie Nelson, Crystal Gayle, George Jones, Emmylou Harris, The Del McCoury Band, Charlie Pride, Allison Moorer, Dwight Yoakam, Pam Tillis, The Jordanaires and other great artists. Proceeds go to benefit The Minnie Pearl Cancer Foundation. Ms. Davies herself first charted in 1978 with “No Love Have I,” a No. 26 Billboard Country hit that Pierce had recorded (and taken to No. 4) in 1959. Footage of Pierce singing “There Stands the Glass” was featured in the 2005 documentary No Direction Home by Martin Scorsese about early influences on Bob Dylan. Pierce’s hit single “More and More” was played in the title credits of 2006 horror film, The Hills Have Eyes.